Join other Ron Paulers this November 5th for the largest one day political donation event in history. The goal is to bring together 100,000 people to donate $100 each, creating a one day donation total of $10,000,000. Click the following link for more info about the Ron Paul Money Bomb. Click the following link to to donate to Ron Paul on Novemember 5th! Ron Paul is Under the Sea! ImageMagick’s mogrify is a great command line tool to resize images. You can resize all your JPG images in a folder to a width of 600 and maintain aspect ratio with this command. Ever wonder where you should go to lunch? This should help…. What will save ColdFusion? To Create Better Internet Applications Quickly and Easily! RIAMS? 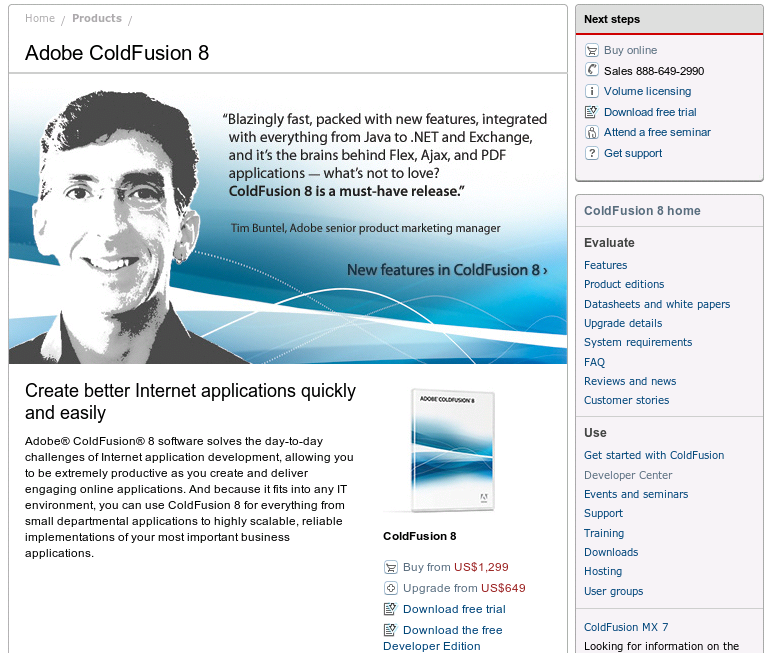 Straight from the ColdFusion WebSite, ColdFusion is promoted as a tool to “Create better Internet applications quickly and easily”. Following this simple slogan will put ColdFusion back on top. A couple weeks ago I was designing my next big ColdFusion application, and was debating whether to use Mach-ii or Model-Glue. Currently about 30% of my apps are Mach-ii and 30% are Model-Glue. Just for kicks I saw that Fusebox 5.5 Public Beta was released, and decided to check it out. As I was creating a test app in FuseBox, I said to myself “This Sux!”. Not FuseBox, the entire ColdFusion framework process. Why should I be worrying about a framework, shouldn’t I just be building the application? Isn’t ColdFusion supposed to be easy? Recently I have been using WordPress, Joomla, & Drupal for some personal & side work I have been doing. They are all beautiful things! For example my wife needed a website for her business. I created a simple WordPress site and she was able to add pages, text, and pictures by herself. I was easily able to find a suitable (mostly free) plugin to add simple shopping cart functionality. I was able to find a really nice plugin to add a Flash based photo gallery. We didn’t use one, but there are thousands of high quality themes available. Nearly anything I was looking for was available in one spot. Digg Plugin, YouTube plugin, flash video plugin, caching plugin, captcha plugin, ajax, contact forms, the list goes on and on and on. There was one plugin I couldn’t find. I needed to use a special font on menus and headings. Since all the menus and headings are database driven, I decided to create my own WordPress plugin which would generate & cache images with my desire font parameters. After a little research I was able to make a pretty decent plugin. I haven’t done so yet, but after a little polishing, I am going to upload the plugin to wordpress.org for the community’s use. This RIAMS should be written by nobody else except the mighty Adobe. Some may say that this task shouldn’t be Adobe’s, and that the community should rally to built the ultimate RIAMS. I disagree, only Adobe can make this work. No matter what Adobe or the ColdFusion Guru’s might say, ColdFusion is not a community driven product. ColdFusion is a corporate product, and it is Adobe’s responsibility to drive the technology, and make it as simple and productive as possible. Adobe is the driving force behind these technologies, and Adobe should be the one source of light, knowledge, and authority behind this RIAMS. If all the ColdFusion community is building applications one way (The Adobe Way), it will help everyone share ideas & code more easily. It probably won’t be perfect, but everyone will be moving in one unified direction. Of course I feel that everyone should be free to do things the “Old Way”, but why would they want to? And this still doesn’t prevent the next GURU from doing something better than Adobe, but why would they want to, if everyone is already doing things the Adobe’s RIAMS way? The following is a short list of what this RIAMS should contain. By no means is this list complete. At one time ColdFusion was light years ahead of all other web technologies, now they have fallen behind in many respects. There is the potential for much richer applications using ColdFusion & Adobe’s other products, but there has been very little improvements in the fundamentals of creating applications quickly and easily. A ColdFusion RIAMS would be the ultimate solution for helping me create a complete application from start to finish in the shortest amount of time. Adobe does not have any time to waste before ColdFusion is years behind how most developers will soon be building their applications. ColdFusion 8.5 (including this RIAMS functionality) should be available for Beta in testing in 6 months, with a June 2008 release date. Until I hear Adobe’s announcement of this ColdFusion RIAMS, I will always use the words “legacy” and “ColdFusion” in the same sentence. It is simply quicker and easier to extend an alternative language CMS, than to create a ColdFusion application from scratch. Adobe are you listening??? Please put the Rapid back in Rapid Application Development! I am a YouTube Hero! Well not really, but a video I posted almost a year ago has had over 11,000 views. That is 30+ hits a day. I am actually the #1 result when you search for Alma Llanera on YouTube. I am not sure why anybody cares, probably just people passing by. This was a performance by myself and a couple of buddies at a local LDS Church’s annual Latin Festival. Not too bad for a couple of gringos.